Make too many of those turkey-bacon meatballs for your party? Here's a pretty obvious (but no less delicious) way to repurpose them: in a pasta sauce! 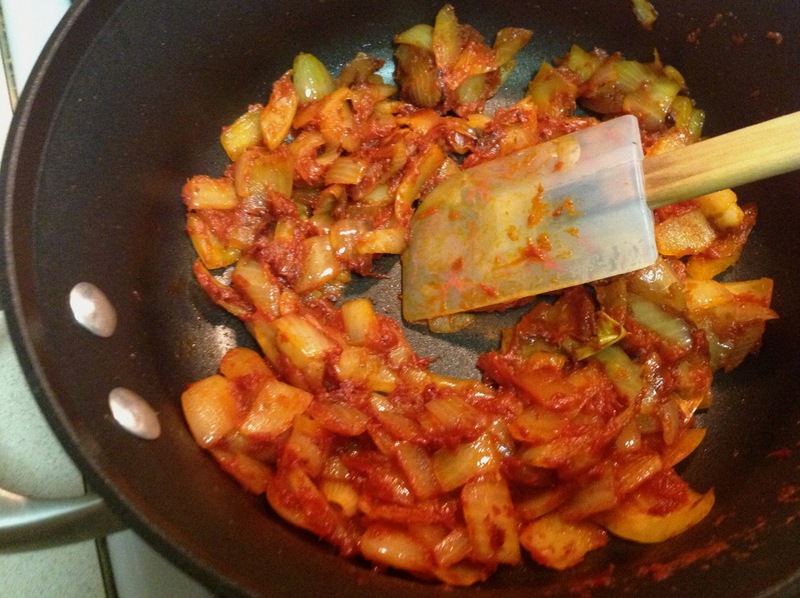 Cook the tomato paste with the onions until the mixture darkens, about 3 minutes. Be sure to stir it constantly so the paste doesn't burn. I like this tomato sauce because it's pretty thick, which helps it stand up to the meatballs. I actually doubled the proportion of tomato paste from the original America's Test Kitchen recipe, which made it even thicker, as well as being a good way to use up any leftover tomato paste from making the meatballs. Win-win all around. 1. Bring a large pot of salted water to boil. Add pasta and cook according to package directions. Drain and set aside in large pot. 2. Heat olive oil in a large skillet or wide saucepan. Add onion and oregano and sauté until soft and starting to brown, about 10 minutes. Add tomato paste and cook, stirring constantly, for about 3 minutes until quite dark. Add garlic and cook another minute 30 seconds until fragrant. Add crushed tomatoes and broth, stirring to combine with onion/tomato paste mixture. Cover and reduce heat to medium-low to simmer for about 10 minutes. Season with salt and pepper. 3. 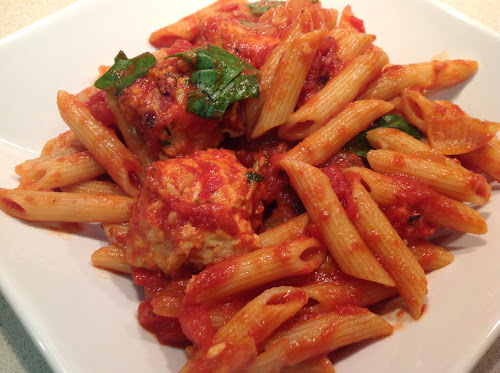 When ready to serve, add meatballs, sauce and basil to large pot with pasta. Stir to combine. Serve in bowls topped with parmigiano-reggiano cheese. Your pasta is always yummy. Thanks dear! Reading your recipe for the first time, but impressed by it. Thanks! It's a good dish and simple to make, especially if you already have the meatballs on hand.